On December 7th, BUY had one of its photo frames selected for the Daily Deal. BUY already had four other listings for the same “NEW Philips 7 Inch Metal Digital Picture Frame” running. Each of the four listings had either 2398 or 2400 quantity available but the daily deal had only 2298. That listing sold all 2298 of its items. According to Randy Smythe’s original posting (story has since been removed) eBay had a glitch causing BUY to oversell. To make matters worse, BUY created another listing the next day consisting of another 2398 at a higher price. My educated guess is that BUY had around 2400 photo frames in their inventory, created multiple listings with the assumption that only 3 – 4% would sell, got selected for the daily deal, and got caught off guard when they sold all their posted inventory. Note that 2298 is approximately 4% less than 2398 and this is close to BUY‘s historical sell through rate on eBay. We’ll probably never know what really happened, but what we do know is that once the negatives started rolling in eBay began removing them. Buy.com oversold item, won’t accept my payment, and won’t cancel my transaction. Many sellers, including myself, are guilty of having oversold the occasional item. I will state that when this was the case I never faulted the buyer, reported them as a non-paying bidder, or raised my prices in other listings. I’ve always made it right with the buyer usually by offering free upgrades or immediately refunding them and giving them another seller to buy from. I’ve heard of other sellers using BUY‘s tactics but I’d hope that this practice has mostly ended as a result of last year’s changes. I didn’t remove any feedback I left. I see that it is gone, but this was not up to me. I left neutral and meant it. What’s the deal? Thank you. Buy or buy.com will not be recieving my business in the future. How were you able to notice this? I am very impressed that someone is paying attention and has the ability to do a bit of research. you never gave me my code for B@K on live marketplace. Never returend emails. The title itself was “Banjo – Kazooie: Nuts and Bolts with BONUS! (includes Download Code for original Banjo-Kazooie)” so this is a legitimate complaint regarding the item. I was also able to verify that the buyer did pay for the item. I contacted eBay’s Griff about six weeks ago regarding this but have received no acknowledgement. I can only assume even he could not blame these on policy violations as he has done in the past. TameBay’s Chris Dawson also avoided comment when I pressed the issue with him and how it conflicts with his belief on how eBay should treat its buyers. Instead I was given an answer to another question basically saying not to worry about the “odd negative” I may receive as a seller. When I posed this question in the feedback forums on eBay they seemed to overwhelming believe BUY should not have their feedback removed. As stated in a previous entry if none of this feedback had been removed BUY‘s feedback rating would have remained the same 99.6%. Instead of helping BUY, eBay has silenced its buyers who did nothing wrong, lost BUY future business, lost buyer confidence, and made eBay a more hostile trading environment. It appears that we just found a new diamond powerseller. This is one of the few eBay grown diamonds and they even started selling back in 1999. Beckertime has been added to the list. It does seem a little odd that such a company would still be using AOL for their email and their About Me page definitely needs work. This site was initially created to give a rational explanation for every feedback that was removed from eBay’s Diamond Powersellers. The site could then be used as a reference anytime a forum thread or blog post was created making the claim that feedback was being manipulated. It was expected that almost all comment removals would be the result of buyers becoming suspended or revising their feedback. Early results showed just that. However, this past week things have become much less clear. At 13:57PST on December 8th eBay user emptycloset1949 left neutral feedback for shoplet stating “Started off with problems, but everything resolved to my satisfaction.” Sometime between 23:00PST and 23:59PST on December 8th that comment was removed from shoplet’s profile. A violation of the Feedback Abuse policy. A member is unable to form a legally binding contract at the time the item ended or Feedback was left. A member provided eBay with an email address that is invalid and could not be contacted at the time of the transaction. 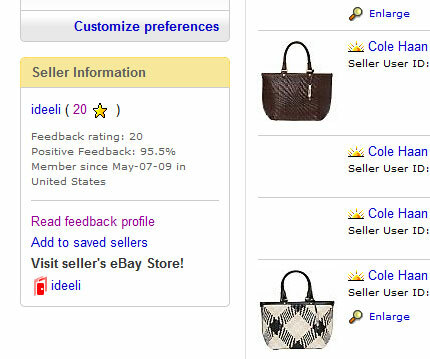 A member mistakenly leaves negative or neutral Feedback intended for another member, informs eBay of the error and has already placed the same Feedback for the correct member. If a member is suspended by eBay, negative & neutral Feedback left by that member is removed. eBay is provided with a valid court order requesting Feedback Removal. A buyer fails to respond to the Unpaid Item process. The communication and comments left by the buyer within the Unpaid Item Dispute Console undermine the integrity of both the Unpaid Item process and the eBay Feedback system. The transaction was completed as indicated by both the buyer and seller through feedback. I was successfully able to contact the buyer through eBay within hours of feedback removal and since the seller was able to resolve the issue the buyer must have been able to communicate with seller. The buyer has not left the same feedback for another member. The buyer was not suspended at the time we detected the feedback disappeared. This means the buyer would have been suspended and reinstated all within less than one hour. There is nothing actionable regarding the comment nor would the courts work that quickly. The buyer paid as evidenced by the positive feedback they received. Anyone who is fluent in English can clearly see that the comment does not contain any of these. During the same week BUY had one negative and one neutral feedback removed that are also suspicious. “buy.com and microsoft lied about the cashback. Buy.com has the worst CS” and “Awful customer service, never got my 30% cashback from live.com due to seller.” Neither of these buyers were suspended nor did they revise their feedback. Looking at the above comments I can see two possible rule violations but both are a stretch and could only plausibly be used if one was looking for a reason to remove them. 1) Both comments refer to either buy.com or live.com . These could be construed as links and may even have been picked up by an automated system. In fact the eBay rules are clear that users may not post links to websites where items are sold outside of eBay. eBay considers usernames that look like URLs and even images or watermarks containing URLs to also be links (a rule that shoplet blatantly ignores in its product images). However 45 other negative and neutral comments on BUY’s profile have something dot com in them making this unlikely. 2) Both comments refer to Microsoft’s Live cashback program. After searching BUY’s current feedback I found that no comments reference the cashback program. This could be construed as “references to a completely separate transaction or unrelated experience”. This is the only rational explanation that I can give within the guidance of eBay policy even though it a stretch. Could it also be possible that eBay does the right thing and doesn’t penalize any of its sellers for misunderstandings or glitches caused by the Live search cashback program? If you’ve received negative or neutral feedback as a result of this program and can clearly demonstrate that we’d like to hear from you. Is manipulation going on with these feedbacks? I’ve already shown that the posted policies do not seem to fit with the removal of shoplet’s feedback. The common thread among these three feedbacks is that they all seem unfair. All sellers eventually get this feedback. We all receive the occasional neutral saying things like “OK” or “Good product” and the only real option given to us by eBay is to use up one of our few feedback revision requests. Otherwise we can face lowered standing, higher fees, and possible suspension. No member, regardless of size or type, receives special treatment or dispensation when it comes to policies and especially when it comes to feedback. Anyone who claims otherwise is spreading misinformation. That’s fine and I’ve heard this before. But I’ve also heard eBay deny that they even negotiate fees with their diamond powersellers. However not only does it not make any business sense I have some counterexamples. Powersellers like myself are given better treatment than sellers who aren’t. For example powersellers cannot receive negative feedback within seven days of a sale. Another example is that bronze powersellers are allowed 4 policy violations per 60 days but titanium powersellers are allowed 7 in the same period of time. There is also the case of shoplet’s item #170282685061 where they clearly violate the listing policy for links within images. All of shoplet’s listings also have the term “Shoplet.com” twice in the description. Even after multiple reports these listings are never removed. Smartbargains recently had no problems listing items while having a communication DSR of 3.8 and a BDR percentage of over 20%. I do not know why it was removed. I felt I was justified in my feedback and made a point of saying they finally rectified the mess. Thank you for contacting Shoplet.com. I can’t locate where the order “started off with problems”. I’ve also asked for the report they made to eBay for feedback removal but haven’t received a response yet. The thing we must all remember is that every corporation is made up of individuals. I have no idea how things are run at eBay but I’ve yet to hear anything good. But imagine yourself working for a company that just laid off 10% of its workforce in the middle of a global recession. If one of that company’s most valuable clients asked you to remove something posted unfairly about them, would you? Despite the evidence presented, there is reason to doubt manipulation is going on. Shoplet’s feedback was neutral so it did not negatively affect their rating. The comment itself was positive. The effect on shoplet’s BDR was negligible and either way leaves them well below eBay’s 5% NPS threshold. There was no noticeable effect on their DSRs. The buyer did rate all four categories but the change was less than 1/10th of a point in every category. BUY’s feedback rating is currently 99.6% . In order for them to have a 98% or lower feedback rating they would have to receive over 7600 negative feedbacks. If there are any less than that then there is no benefit to removing feedback. They currently have just over 1500 negative comments for the year. That would mean eBay would have to be removing more than 15 negatives per day for them to achieve their current rating. For the past two weeks we’ve only seen 9 removed which is less than one per day. Even at this rate that would mean BUY should have a rating of 99.5%. Keep in mind that BUY is the only diamond powerseller with a high feedback score. So while it is highly unlikely that BUY is having feedback removed this still may not be the case for the others. While I can’t explain the reason for shoplet’s feedback removal, by itself, this is not conclusive proof that eBay manipulates their feedback. There is little benefit to anyone involved for this one feedback to have been removed. However it is very important if this is part of a larger pattern. We’re watching. EventHorizon1984 has an interesting entry regarding the first two feedbacks for one of eBay’s newest Diamond powersellers. As many have noticed their first (and third!) feedback on eBay turned out to be negative. However, it turns out that SmartBargain’s first positive feedback was left a whole 24 minutes after the item was purchased. The item was apparently shipped across country via UPS Ground. Very accurate and fast. I would definitely buy from this seller again. Now we aren’t going to speculate who left this feedback or what their motivations were, but it definitely makes one wonder about the future of this seller.